Shop GHS Boomers 6 String Electric Guitar Strings from AMS and enjoy Fast & Free Shipping. 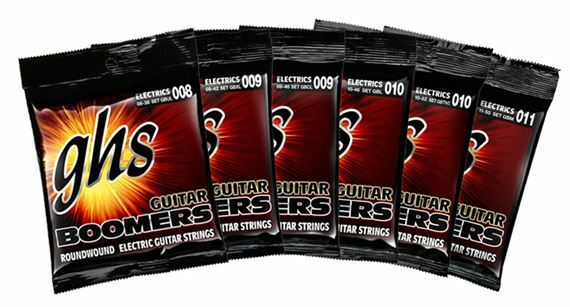 GHS Boomers Electric Guitar Strings are GHS' most popular strings for electric guitar. Roundwound, with nickel plated steel wrap. Designed for Heavy Metal, Rock, Country, Blues, and Pop styles. GHS guitar strings are made on GHS' in-house string machines by their expert staff. Before they leave the shop, each string is meticulously inspected by hand. Under high magnification, each string must pass a series of tests before it wears the GHS logo. Having been in the string business for 35 years, you can really hear their expertise and experience. It's no wonder GHS strings are played all over the world - from garages to 50,000 seat stadiums. GHS strings are the music industry's choice whether you want a fat, bright tone or bluesy, warm, mellow sonics. Ultra Light; .008, .011, .014, .022w, .030w, .038w. Extra Light; .009, .011, .016, .024w, .032w, .042w. Custom Light; .009, .011, .016, .026w, .036w, .046w. Light; .010, .013, .017, .026w, .036w, .046w. Medium; .011, .015, .018, .026w, .036w, .050w. TNT; .010, .013, .017, .030w, .044w, .052w. These are great strings to beat on ! I like the strings. I've been buying them for years. However, as of October 15, 2018 the description on AMS is incorrect. Custom Light gauge is 9-46 not 9-49. Got these along with a new Fender amp and Fender Strat as a surprise for my husband!! He absolutely loves everything! I’m thrilled with the quality and prices of everything and will definitely be shopping here again! Thanks so much! Put them on 2 of my SGs super lights love m! Great Stings, Well Worth the price! Great Strings! Stay in tune, feel great and sound great. Also, you don't have to worry about breaking or them going dead. I love GHS Boomers. Since I started using GBM Medium Boomers on my LP Junior in 2011, there's no other string for me. These strings have a beautiful, edgy bite right out of the package, and I've yet to have any of my GBMs lose that tone. The feel of GHS Boomers in general is excellent. They're much smoother than other round-wound strings I've played, have just the right amount of slack when tuned to standard, D-standard, or drop-C, and don't take forever to stretch into place. The tone of my GBMs is heavy and bright all at once. I can only describe it as sounding like a wolverine with the voice of Luciano Pavarotti. The action is perfect. Even in F#-standard (which I sometimes use to play along with alto and soprano vocalists), they're comfortable and durable. I'm not a fastidious string cleaner like some, so my common practice is to run a dry rag over my strings when they start looking dusty, and they're just as bright and shiny now as the day I put them on. Here's where the GBMs really shine. I started using them in the summer of 2011, two years prior to this review, and with an average of three hours of aggressive daily playing, I've never had a set lose its tone on me, and I currently have my third set on my guitar, only changing them when I break one. Averaged out, so far, these strings have had a playing life of 1,642 hours and 30 minutes per set with no tone issues. Try them out; they won't disappoint. some of the best strings I've used. I used to be a strictly Ernie Ball Slinkys kind of guy untill i tried these. Not much to say, they are long lasting, great sounding strings. Most dependable strings I've ever used. Great tone, great feel. Buy individual sets! No other string I've tried lasts longer than GHS at a great price. Buy individual sets! Overall, great strings! However, If they're going to make a package of 3 sets, package them as 3 individual sets, or at least by individual strings... NOT 3 strings in one envelope. D'Addario has the best packaging, but not the greatest strings. I hope GHS follows in the packaging department. Buy individual sets! Very nice tone, a little bright, but you can compensate for that.